Protein is an essential component to any diet. When your body digests protein, it breaks the protein down to amino acids, which it uses to maintain and repair the cells in your body, as well as to make new cells. Nine of these amino acids are essential, meaning your body cannot make them, so you need to get them through your diet. Both nut protein and meat protein contain at least some of these essential amino acids. The type of protein found in meat is called complete protein because it contains all nine essential amino acids. However, this protein often comes along with a lot of calories and saturated fat. Limit high-fat meats, and choose lean meats and vegetarian sources of protein to meet your protein needs, recommends the Harvard School of Public Health. The protein found in nuts is incomplete protein because nuts lack some of the essential amino acids. However, as long as you vary your sources of incomplete protein and don't rely on nuts alone for your protein this isn't a problem. 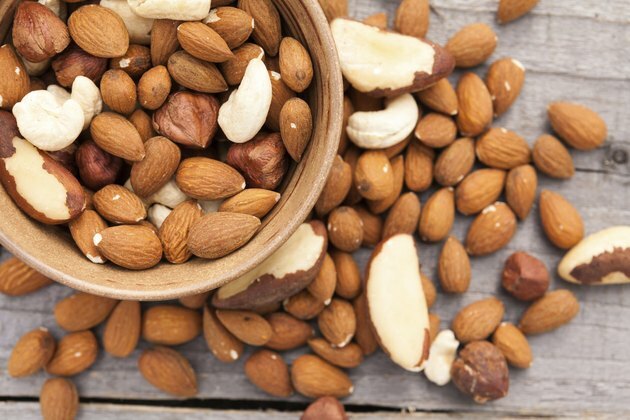 While nuts can be high-fat sources of protein, the type of fat they contain is mostly healthy unsaturated fat, and they also contain numerous essential vitamins and minerals. If you count on the protein from nuts to meet your protein needs, consume either legumes or dairy products as well, as these are complementary proteins which when combined with nuts contain all of the essential amino acids. You don't need to consume complementary proteins during the same meal, just at some point during the same day. Combining any complete protein source, such as meat, poultry, dairy or eggs, with an incomplete source of protein, like nuts, beans or whole grains, will provide you with complete protein. Most people consuming a varied diet do not need to worry about eating too little protein or combining proteins to form complete proteins. However, some vegetarians may need to pay more attention to their protein sources, especially if they follow a very restrictive version of the vegetarian diet.